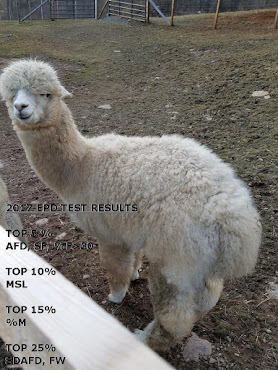 Estimated Progeny Differences (EPDs) are calculated for many fleece traits from data collected from standardized fiber analysis. Growth and maternal traits are also included in the launch of the ARI EPD program (birth weight, weaning weight, and birthing ease). 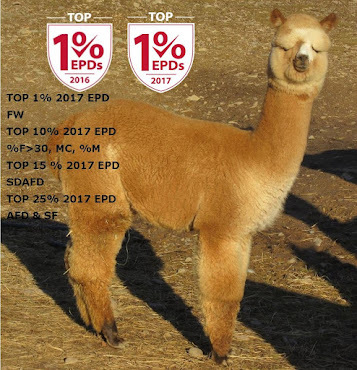 EDPs provide an estimate of the average difference in an individual’s progeny performance as compared to the national herd OR as compared to another individual animal. 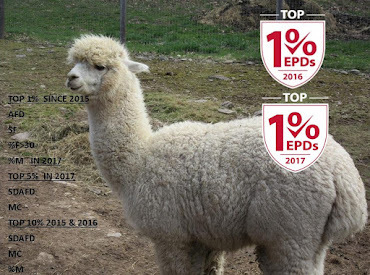 EPDs cannot predict the outcome of a single breeding, but rather predict the progeny performance on average over a number of progeny. 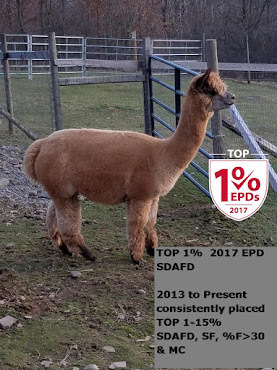 Utilization of EPDs for traits of interest in breeding plans which include selection for desired traits will, over time, move the herd’s performance in the desired direction. EPDs are ONE tool in a breeder’s toolbox of methods for making informed breeding decisions. Conformation is not yet addressed by the ARI EPD program. Other traits such as maternal characteristics are also not yet addressed by the program. More to come! 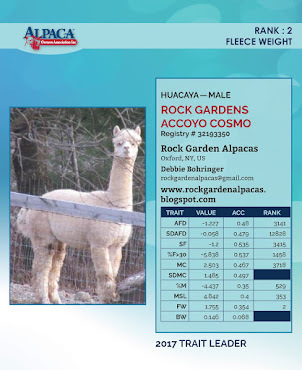 Fiber samples are collected from the alpaca mid-side during annual shearing of the entire herd or entire group which has been maintained under the same environmental conditions (contemporary group). It is simple, but very important, to send representative fiber samples for testing. The integrity of sampling (the careful and proper selection of a sample) is the most critical factor involved in measurement of fiber diameter in individual animals. The samples must be taken at the middle of the side in the blanket location. Yocom-McColl Testing Laboratory, utilized for fiber analysis for the ARI EPD program, is equipped with the state-of-the-art instrumentation for measuring animal fibers. The Sirolan Laserscan, developed by CSIRO, and Optical Fiber Diameter Analyzer (OFDA), developed by BSC Electronics are used by the laboratory. Both companies are located in Australia. These instruments are calibrated using Interwoollab s tops, the only recognized supplier of calibration tops to the worldwide textile industry. A diagnostic and calibration check is performed daily on analytical instruments. The accuracy of measurement of average fiber diameter is ± 0.3 microns and the tests are performed under standard conditions of 65% ± 2% relative humidity (RH) and a temperature of 70° ± 2°F. The ARI EPD histogram provides data on the following fiber measurements. EPDs will not be calculated from all of the data as described below. No EPD will be reported for this derived value that is reported on the histogram. The Coefficient of Variation is the Standard Deviation divided by the AFD multiplied by 100 and reported as a percentage. The CV is used in the statistical analysis of different populations of fiber (different animals). CV can be made smaller (more desirable) by either a lower SD or a higher AFD and therefore could result in undesirable consequences if used as a selection factor. Comfort Factor is simply 100 – the % fibers > 30 microns. An EPD will not be reported for this value. characteristic for breeders in considering mates for maiden females, especially if the female is smaller. Birth weight data is reported directly to ARI by breeders through their account pages. 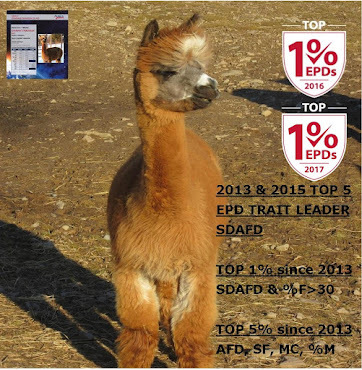 A negative EPD value indicates that the animal’s progeny will be, on the average, smaller than the breed average. EPDs will be reported for weaning weight when sufficient data is accumulated. Weaning weight may or may not be a trait of interest to most breeders. Weaning weight data is reported directly to ARI by breeders through their account pages. 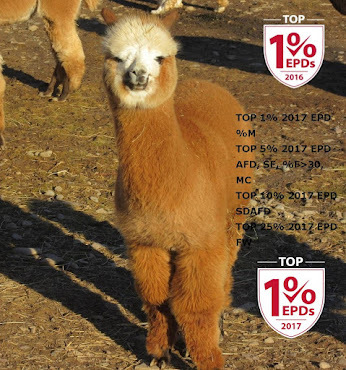 A positive EPD value indicates that the animal’s progeny will be, on the average, larger at weaning than the breed average. EPDs will be reported for birthing ease when sufficient data is accumulated. Birthing ease data is subjective and reported by the breeder by selecting one of the 4 categories describing the ease of birth for individual females. This trait is important for husbandry of herds of alpacas. In other livestock species this trait has been shown to be heritable by the daughters of sires and the EPD will be reported for both males and females. When reported for males it will reflect the genetic impact the sire has on his daughter’s birthing capability. 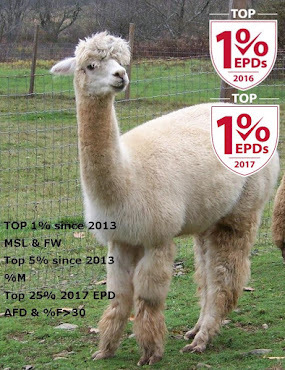 A negative EPD value indicates that the animal’s progeny will, on the average, birth with less difficulty than the breed average (this does not, by any means, indicate that females will not have birthing difficulties!! ).